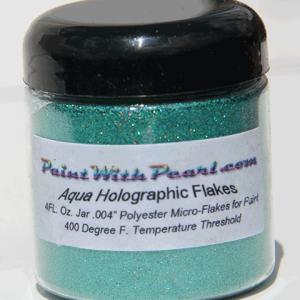 Aqua Blue Holographic Metallic Flake for a green sparkle with a rainbow reflection. 4 Fl. Oz jar is 1 cup of flakes and it will add amazing effects to an entire car. 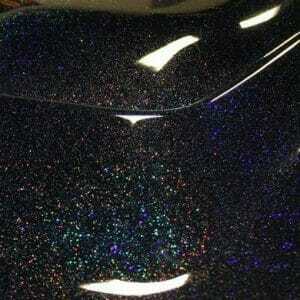 This car hood is painted with a beautiful Black Holographic Metal Flake in .004 size. Slight black sparkle in the shade, linear rainbow in the sun. 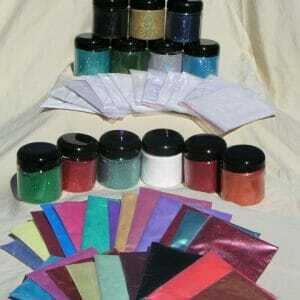 Blue Holographic Metallic Flake for a blue sparkle with a rainbow reflection. 4 Fl. Oz jar is 1 cup of flakes and it will add amazing effects to an entire car. Chartreuse Metal flake available in 3 Sizes, Micro .004", Mini .008" , and Bass Boat .015" 400 degree temperature threshold. Available in 4 oz. Jars or 1 lb. Bags. Emerald Green Metal flake available in 3 Sizes, Micro .004", Mini .008" , and Bass Boat .015" 400 degree temperature threshold. Available in 4 oz. Jars or 1 lb. Bags. 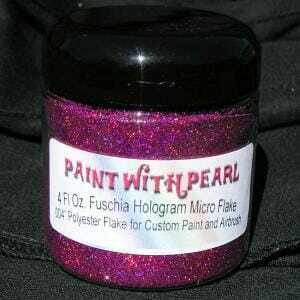 Fuchsia Holographic Metal flake available in 3 Sizes, Micro .004", Mini .008" , and Bass Boat .015" 400 degree temperature threshold. Available in 4 oz. Jars or 1 lb. Bags. 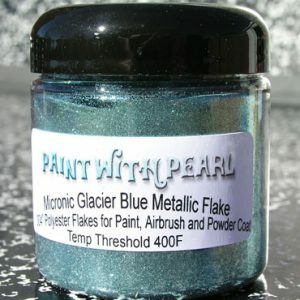 4 Fluid Oz Bottle of Glacier Blue Metallic Flake .004" for use in Paint, Airbrush, and Powder Coatings (that's four-thousandths of an inch). The great thing about these little metal flakes is that they still have a big reflection - without all the extra work of those bass boat flakes. The problem is, with larger flakes you need to do a lot of surface prep after spraying them. 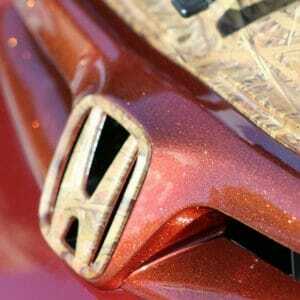 With our tiny flakes, you can still get a metal flake spray job and great sparkle without all of the flake sanding and prep work before applying your final clear coats. 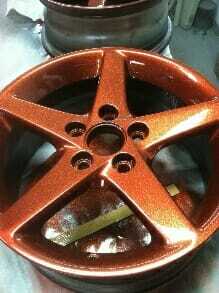 Small enough to spray through an airbrush and HVLP fine nozzle, with the benefits of the old school flakes sprayed by the legends of kustom paint and powder coating. 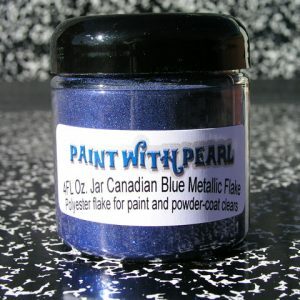 These Glacier Blue Metallic Flakes are truly classic in a kustom paint job. One 4oz, Jar or choose 1 lb. of Gold Green Blue Chameleon Flakes. Change Color with light and direction. 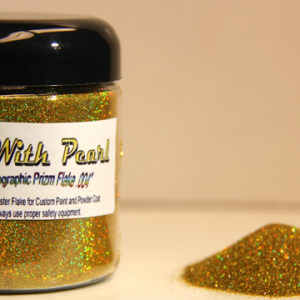 Gold Holographic Metal flake available in 3 Sizes, Micro .004", Mini .008" , and Bass Boat .015" 400 degree temperature threshold. Available in 4 oz. Jars or 1 lb. Bags. 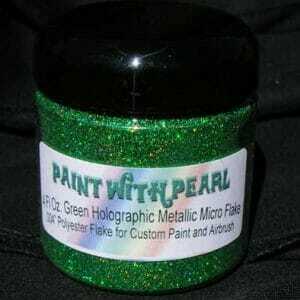 Green Holographic Metallic Flake for a green sparkle with a rainbow reflection. 4 Fl. Oz jar is 1 cup of flakes and it will add amazing effects to an entire car. 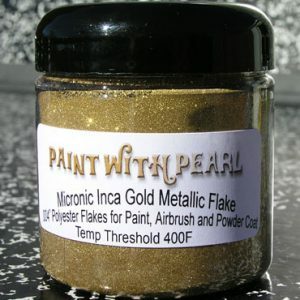 Inca Gold Metal flake available in 3 Sizes, Micro .004", Mini .008" , and Bass Boat .015" 400 degree temperature threshold. Available in 4 oz. Jars or 1 lb. Bags. 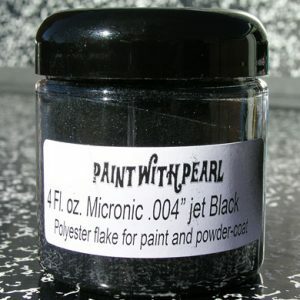 Jet Black Metal flake available in 3 Sizes, Micro .004", Mini .008" , and Bass Boat .015" 400 degree temperature threshold. Available in 4 oz. Jars or 1 lb. Bags. 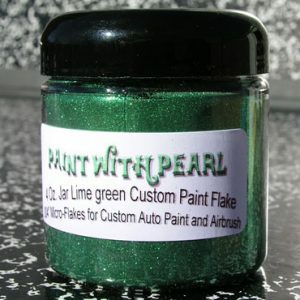 Lime Green Metal flake available in 3 Sizes, Micro .004", Mini .008" , and Bass Boat .015" 400 degree temperature threshold. Available in 4 oz. Jars or 1 lb. Bags. 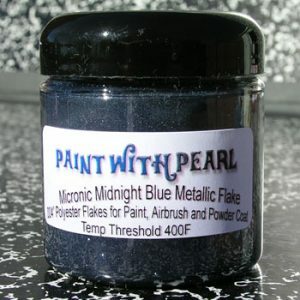 Midnight Blue Metal flake available in 3 Sizes, Micro .004", Mini .008" , and Bass Boat .015" 400 degree temperature threshold. Available in 4 oz. Jars or 1 lb. Bags. 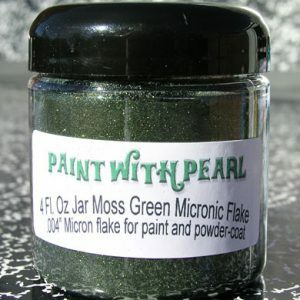 Moss Green Metal flake available in 3 Sizes, Micro .004", Mini .008" , and Bass Boat .015" 400 degree temperature threshold. Available in 4 oz. Jars or 1 lb. Bags. 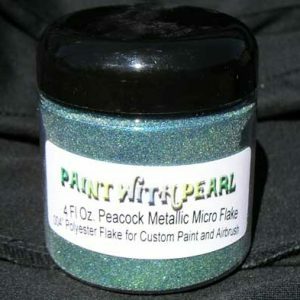 Peacock Metal flake available in 3 Sizes, Micro .004", Mini .008" , and Bass Boat .015" 400 degree temperature threshold. Available in 4 oz. Jars or 1 lb. Bags. 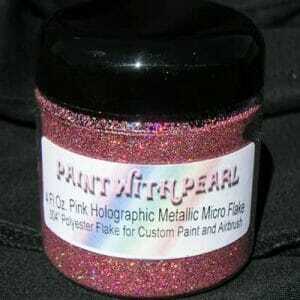 Pink Holographic Metallic Flake for a pink sparkle with a rainbow reflection. 4 Fl. Oz jar is 1 cup of flakes and it will add amazing effects to an entire car. 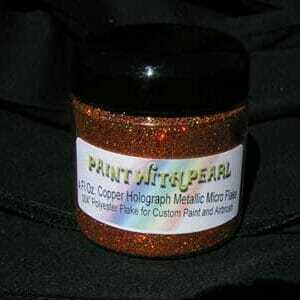 50 of our top selling products including 15 jars of metal flake, 34 Kolor Pearls/Illusion Pearls/flip pigments and one glow in the dark pigment. 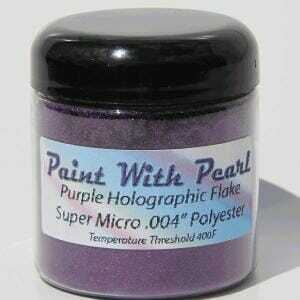 Purple Holographic Metallic Flake for a purple sparkle with a rainbow reflection. 4 Fl. Oz jar is 1 cup of flakes and it will add amazing effects to an entire car. 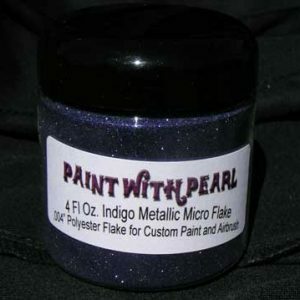 Purple Metal flake available in 3 Sizes, Micro .004", Mini .008" , and Bass Boat .015" 400 degree temperature threshold. Available in 4 oz. Jars or 1 lb. Bags. 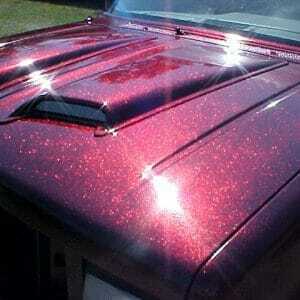 Red Holographic Metallic Flake for a red sparkle with a rainbow reflection. 4 Fl. Oz jar is 1 cup of flakes and it will add amazing effects to an entire car. 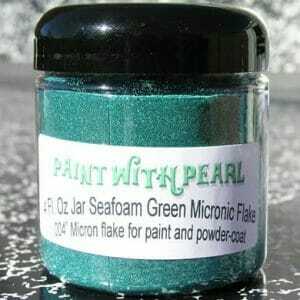 Seafoam Metal flake available in 3 Sizes, Micro .004", Mini .008" , and Bass Boat .015" 400 degree temperature threshold. Available in 4 oz. Jars or 1 lb. Bags. 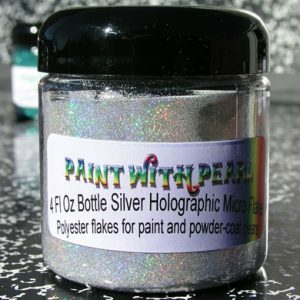 Silver Holographic Metallic Flake for a silver sparkle with a rainbow reflection. 4 Fl. 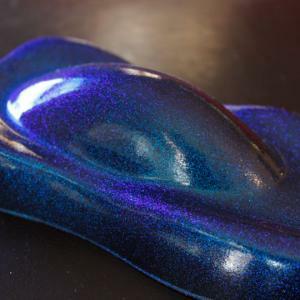 Oz jar is 1 cup of flakes and it will add amazing effects to an entire car. 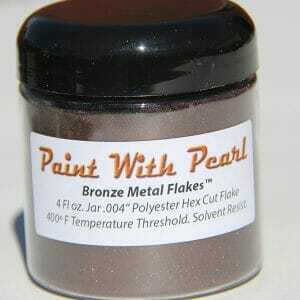 Silver Metal flake available in 3 Sizes, Micro .004", Mini .008" , and Bass Boat .015" 400 degree temperature threshold. Available in 4 oz. Jars or 1 lb. Bags. Strato Blue Metal flake available in 3 Sizes, Micro .004", Mini .008" , and Bass Boat .015" 400 degree temperature threshold. Available in 4 oz. Jars or 1 lb. Bags. 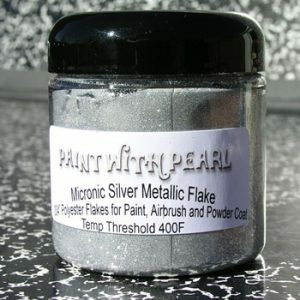 Our Durable “metal flakes” are a great way to add sparkle to any paint job. Our Hexagon flakes are easy to spray, and solvent resistant enough to use in two part epoxy paints. 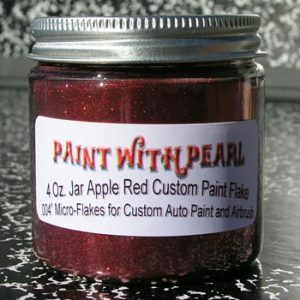 They are heat resistant to 400 Degrees F. Each jar contains about 50 or so grams of metal flakes, or 1 measuring cup. 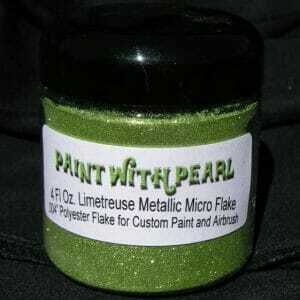 They can be used in many different mediums and even our small .004″ micro metal flakes have been known to give off big sparkle for a low price. Several sellers on Ebay are actually buying our flakes, doubling the price, and reselling them. 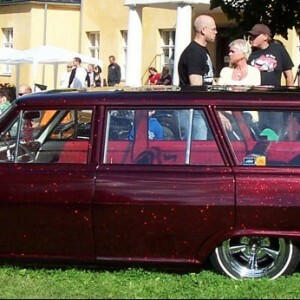 Since the demise of Old School Flake, we have taken over the top spot for kustom paint metal flakes in the US. 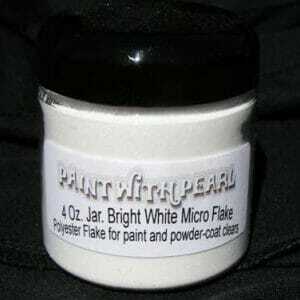 All of our flakes are perfectly solvent resistant so that they can be mixed into the toughest paints without fading or bleeding like the hobby store glitters do. 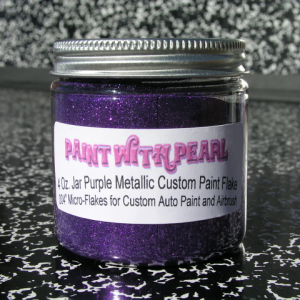 When using a black base coat, our .004″ metal flakes can cover an entire car using 1 jar. 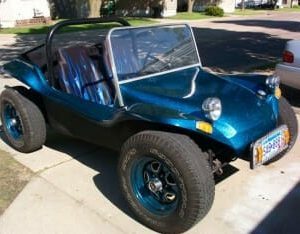 As we often say, one jar does a car! We have seen people use many more for extra sparkle, though. 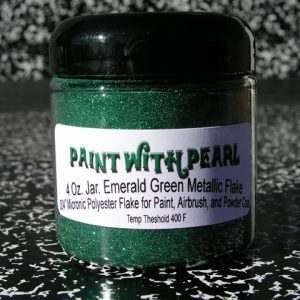 Get a great deal on metal flakes when you shop at Paint With Pearl. 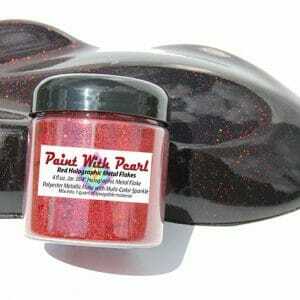 Paint With Pearl is the original seller of pearl pigments on the Internet. We have been around since 2005, and have upheld an amazing reputation in kustomer satisfaction. You can always count on speedy shipping and great kustomer service. When you call us, you will always talk to an owner of the company. That’s great when you have special requests. We have been around since 2005. Check out our old site if you like. As always, thank you for shopping with us!